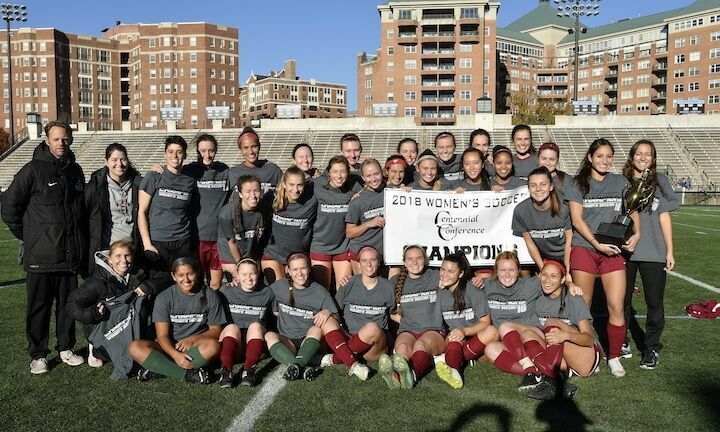 Swarthmore College women’s soccer brought home the Centennial Conference Championship title for the second consecutive year last Sunday. Netting a combined total of 10 goals in two days, the Garnet outplayed both McDaniel and Johns Hopkins in the tournament. Senior captain and two-time All-American Marin McCoy ’19 earned the tournament’s Most Valuable Player award, scored in both the semifinal and final matches, and continues to lead the Garnet offense by creating scoring opportunities. In 2017, Swarthmore faced Hopkins in a conference final game that ended in a penalty shootout. The nail-biting shootout resulted in the Garnet winning their first conference title since 2014. This year, the trophy came much more easily for the Garnet. On Saturday, the Garnet faced McDaniel in the semifinal round of the Centennial Conference tournament. Although the Green Terror scored first, the Garnet responded with a goal from Sophia Stills ’21. Just 33 seconds after Stills entered the game, she made a quick turn and rocketed a shot into the top left corner of the net. While the score was tied 1-1 at half, the Garnet dominated possession for the majority of the 45 minutes. The second half was more reflective of the Garnet’s superiority on the ball. Seven minutes into the half, McCoy blasted a ball to the corner of the net to put the Garnet in the lead, but the Green Terror responded with an equalizer in the 66th minute. Eléonore Moser ’20 then sent a free kick soaring towards the goal in the 72nd minute, and after a McDaniel defender misplayed the ball into their own net, the Garnet were again in the lead. In the 82nd minute, Seneca Kinn-Gurzo ’20 laid a ball off for Bellara Huang ’21, who netted her first goal of the season by tucking the ball right under the crossbar, just out of reach of the Green Terror keeper, increasing the Garnet lead. The final goal of the game was scored by Brittany Weiderhold ’20 in the last minute of play to firmly guarantee Swarthmore’s 5-2 win over McDaniel. The win over McDaniel not only secured a spot for Swarthmore in the Centennial Conference Championship game versus Johns Hopkins, but it also built momentum for the team. Going into the match, the Garnet’s energy was palpable as they showed their eagerness to defend their Centennial Conference Championship title. On Sunday, Hopkins came in as the favorite. The Blue Jays were ranked fourth in the nation prior to the match, but Swarthmore, ranked No. 22, dominated play from start to finish. With a score of 5-1, the Garnet made history by scoring the most goals in a Centennial Championship game. They also tied the 2013 record of 10 goals scored in the tournament, which was previously held by Hopkins. Lizzie King ’21 got the Garnet off to a quick start. She scored the first goal of the match in the fourth minute of play by outplaying the keeper in a one-on-one attack after receiving a through ball directly to her feet from Amy Harris ’21. Harris, a key playmaker in the midfield, leads the team with seven assists on the season. Feeding off the energy of the game, the Garnet maintained possession and were able to find the back of the net again when Melissa Curran ’19 sent the ball across the field to McCoy, who slotted a ball into the bottom left corner. The half ended with Swarthmore up 2-0. Head coach Todd Anckaitis switched from his normal starting lineup going into the second half, starting Weiderhold, Stills, and Grace Taylor ’21 in place of King, Kinn-Gurzo, and Maddy Carens ’20. This proved to be a key tactical move. Inside the first five minutes, Weiderhold sent the ball forward from half-field, finding Stills. Stills was then able to finish on an open net after the keeper came sliding out of the box in an attempt to stop the ball. The next goal came when Weiderhold swiftly took the ball down the left side, beat two defenders, and slammed it into the right corner of the net. Swarthmore’s final goal came in the 67th minute, when King drew a foul in the box resulting in a penalty kick. Sydney Covitz ’20 took the kick and slotted it precisely into the bottom left corner, leaving the keeper with no chance. Each of the game’s five goals were scored by Swarthmore’s five top goal scorers of the season. In order, they are: McCoy with twelve, Weiderhold with eight, Covitz with six, King with five, and Stills with four. With 20 minutes remaining in the game, the Garnet knew they had prevailed once again over the struggling Hopkins. Scrambling to put at least one point on the scoreboard, Hopkins managed to slide one ball past the Garnet defense and into the net for their only goal of the match. Swarthmore’s starting defensive line, consisting of Moser, Curran, and captains Caroline Coats ’19 and Yasmeen Namazie ’19, shut down nearly all of Hopkins’ attempts to create a scoring opportunity during the match. When Hopkins did get shots on target, starting goalkeeper Amy Shmoys ’19 denied the Blue Jay attempts, racking up a season high of five saves in the first 77 minutes of play. Freshman goalkeeper Chantal Reyes ’22 finished the last 13 minutes of play and made two saves. With the conference title secured for the second consecutive year, the Garnet earned an automatic berth to the NCAA tournament. 2018 marks the fifth straight year that Swarthmore will participate in the tournament. The team gathered together in a classroom on Monday, November 5 to watch the NCAA Selection Show, anxiously awaiting the announcement of their bracket. There were screams of excitement as the selection committee announced that Swarthmore will host the first two rounds of the tournament on home turf at Clothier Field where they have a record of 5-1-1. The Garnet, now ranked No. 12 in the nation, are scheduled to play the St. Joseph’s College of Maine (16-3) at 1:00 p.m. on Saturday, November 10 in the first round of the tournament. With a win on Saturday, they will move on to the second round and will face the winner of the NYU (10-5-3) and Virginia Wesleyan (11-4-4) match on Sunday at 3:00 p.m.